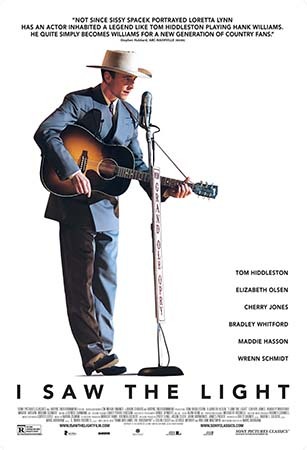 With songs like Your Cheatin’ Heart, Hey, Good Lookin’ and Move It On Over deeply embedded in the American consciousness, one might reckon the fellow who wrote and sang those songs would have an interesting tale to tell. 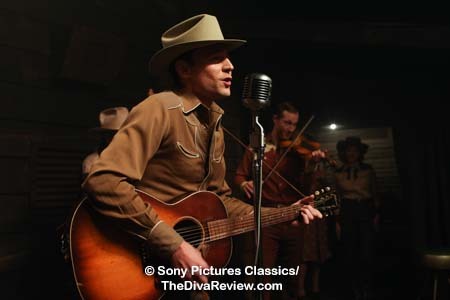 It’s not like Hank Williams, considered the first country music superstar, known as much for his brief, tumultuous life as well as for his music, hasn’t had the big screen treatment several times already. The foremost production being 1964’s Your Cheatin’ Heart, starring George Hamilton, who brought Hollywood glamour - if not physical resemblance - to his portrayal of Williams. 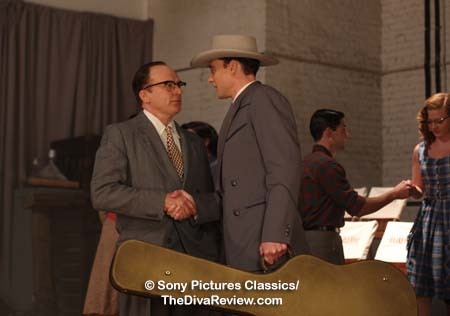 In I Saw the Light, the superbly similar Tom Hiddleston tries his hand at playing the star. 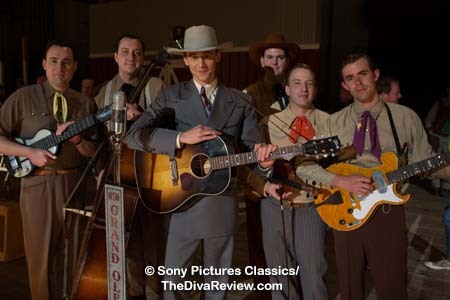 When we meet Hank Williams in I Saw the Light, he’s already on his way to stardom. The singer/songwriter is the host of a popular radio show where he banters jovially and plays the songs live in the studio that will eventually make his name. Hank’s new love is as hungry for success as he is. 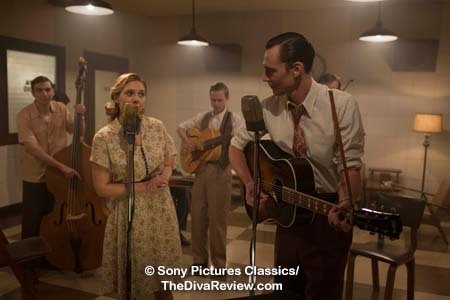 Audrey knows that by helping to push Hank’s star into the cosmos, some of its light will shine on her and the world will discover her own singing talents, which sadly, only she can hear. 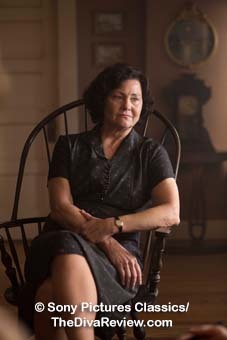 Even marriage and motherhood won’t settle Audrey’s desire for recognition, and it, amongst other things like Hank’s wandering eye and the constant battle between his bride and his beloved mama for dominance over Hank’s career, causes friction between the couple. 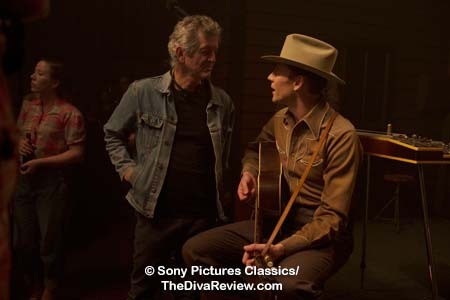 Hank’s mellow, laid-back demeanour and permanently amused expression belies the stress of being pulled in so many directions on the homefront and falling short of his ultimate professional goal of playing in the Grand Ole Opry, Nashville’s mecca of country music. Not that it’s only outside influences preying on Williams’ psyche; his self-medication for life’s disappointments finds him crawling so deep in a bottle that he misses paying gigs, damaging his reputation on the country circuit. That aforementioned wandering eye does him no credit with the tremendously prickly Audrey, and later nearly manages to end his relationship with the second Mrs. Williams after a fling becomes pregnant. Never mind that with his hectic touring schedule, he barely sees his little son by Mrs. Williams v.1. 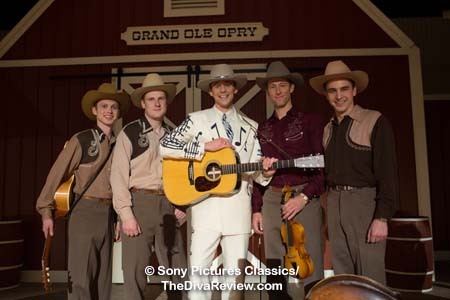 Hank Williams’ eventual success, including achieving his dream of playing at the Opry, seems to bring him no joy. He’s neither happy on the road, nor off it back at home. The lean, lanky man with the omnipresent cigarette in his mouth (accompanied by a constant cough) is burning the candle at both ends. 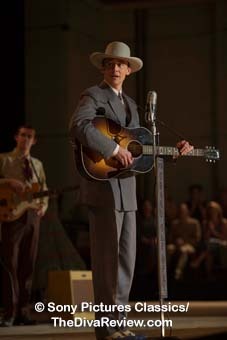 If someone went into I Saw the Light with no idea who Hank Williams was or why he deserved to have a high-profile movie made about him, that person will leave the cinema in exactly the same condition, if not even more perplexed. 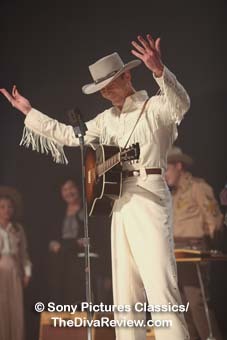 Never have I seen a star’s legacy so diminished as poor Hank Williams in his own film. 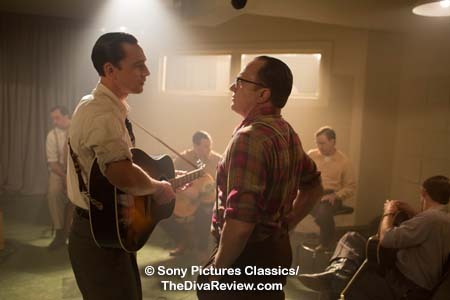 I never believed the life of someone considered a musical legend could be as boring as Williams' is portrayed here. 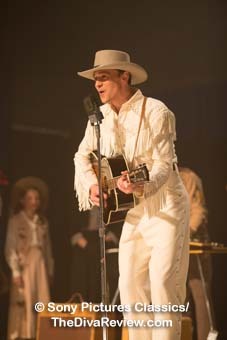 I Saw the Light is a muddied, muddled jumble that gives us no answers or insight into either the man or his music, and makes one wonder why the film was even made? 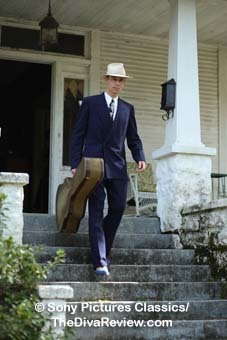 It skips major moments in Williams’ life (Like learning to play guitar at age 8, through the tutelage of black blues musician, Rufus Payne. I mean, how could that be interesting?) 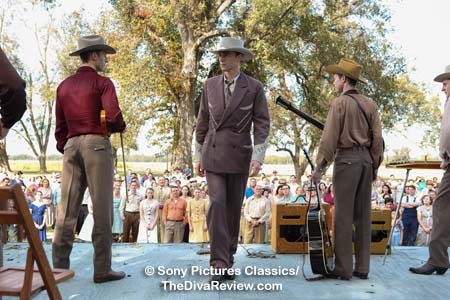 in favour of tired, cliché, countrified soap opera love triangles. There’s nothing particularly shocking in his personal vices. 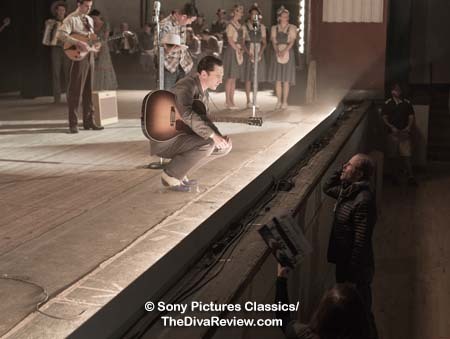 These are pitfalls that have been examined a million times before in far better films about musicians. Here, there’s no real sense of loss or danger in his struggle with alcohol or against his libido. 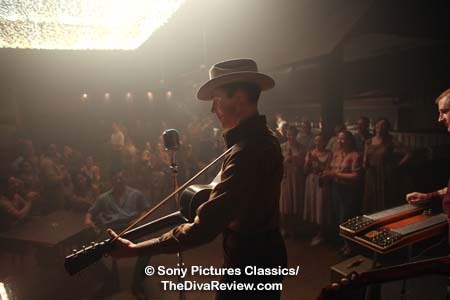 Indeed, whether in his personal life, or in his musical legacy (which one reckons is the point of the film), the script doesn’t give us one reason to think Hank Williams was special, or what exactly separated him from other country musicians of the era? 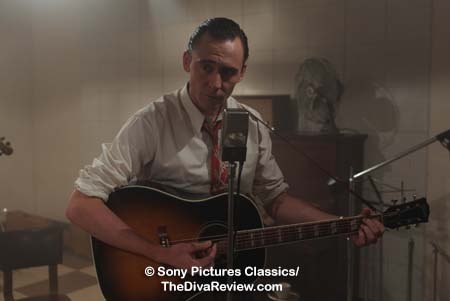 I Saw the Light’s obvious comparison with I Walk the Line, the seminal biopic about fellow musician Johnny Cash, practically looms over every scene, from the overload of moody half-lighting, and the patented 1950s washed-out, yellowy patina over every shot, to the ultra-tight close ups of Hiddleston at the mic, providing his own vocals to the soundtrack. 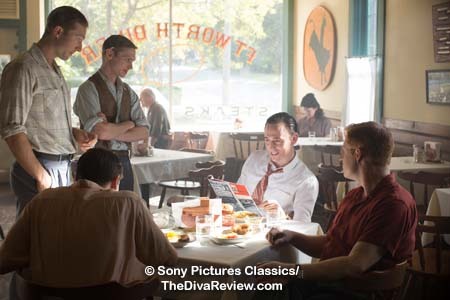 That’s where the resemblance ends, because try as he might, director Marc Abraham simply cannot generate sparks from a script this dry, dusty and dull; which, by the way, he wrote. Even the performances can’t save it. 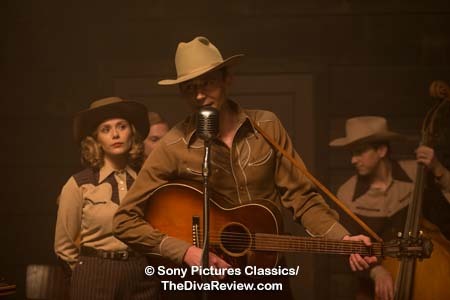 I anticipated Tom Hiddleston’s turn as Williams and while I wasn’t necessarily disappointed, it wasn’t such a tour de force that it whisked away the dreariness of the backdrop. It doesn’t help that we get no answers as to why Williams was the way he was? Why he may have been adored by his colleagues and friends, but was a serial philanderer and addict? 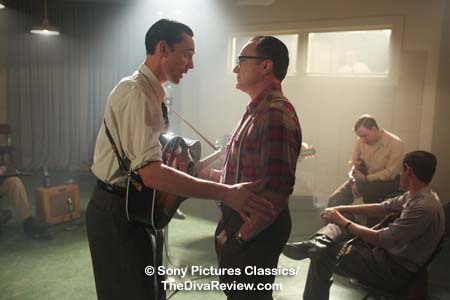 If the film meant to settle more on personality than exploring Williams’ musical legacy, then it fails again as there’s zero character development. 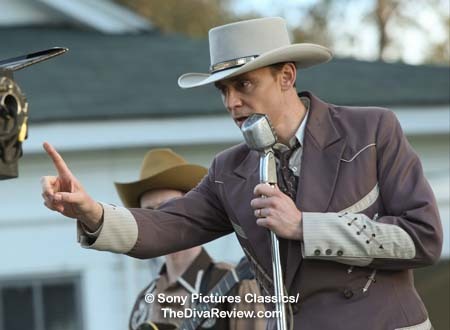 Had there been more meat on that bone, I’m sure Hiddleston might’ve have had a better challenge than simply staying true to Williams’ physical presence and vocal delivery. 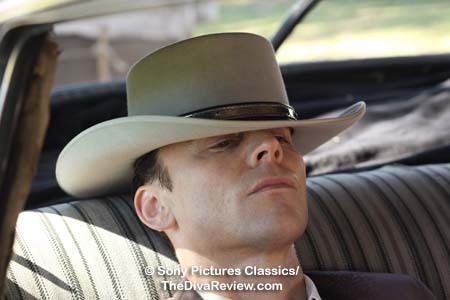 I’m sorry to say the latter of those didn’t knock my socks off, nor did hearing the British actor’s southern accent occasionally waver across the pond. 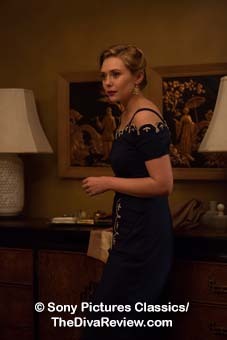 Elizabeth Olsen does far too well grating on one’s nerves as the domineering Audrey. Ear plugs should be handed out for her singing scenes, which are truly meant to be quite terrible, and to that end, her screechy, cat in a blender vocals hit top marks. 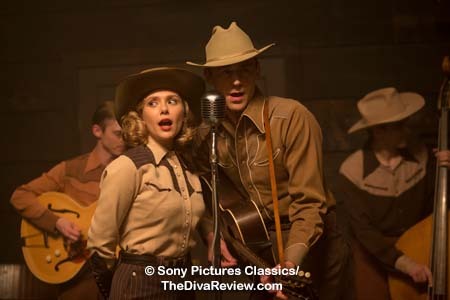 I couldn’t tell if it was intentional that Audrey never gives any indication she has any feeling for Hank as other than her ticket to stardom and wealth, but it felt like yet another lazy writing choice to give her no depth. Of the revolving door of Williams’ lady loves, curiously, it’s Wrenn Schmidt as the woman Hank rejects, refusing to marry her after informing him she is pregnant, who has the most electricity in their scenes together. Actually, had Abrahams chosen to center the whole film around the loving relationship of Williams and his strong, supportive mother, played by Cherry Jones, that would have been a million times more compelling than this incredibly unremarkable, two-hour chicken-fried soap opera. Still, for all the time spent on Williams’ relationships and so little on his actual achievements or impact, the inevitable end, when it comes, carries no heft or emotion. This movie is a failure. 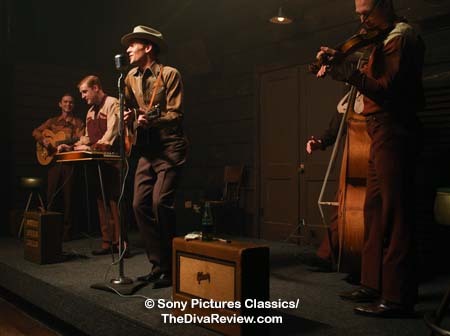 A relentlessly dull, leaden script and direction utterly devoid of spark or inspiration sap away any magic or interest in the story of Hank Williams. I Saw the Light should’ve stayed in the dark.